Production: Horizon Productions; black and white, 35mm, Cinemascope; running time: 108 minutes. Released 1954, by Columbia Pictures Corp. Filmed in New York and Hoboken, New Jersey. Producer: Sam Spiegel; screenplay: Budd Schulberg, from his original story suggested by a series of newpaper articles by Malcolm Johnson; photographer: Boris Kaufman; editor: Gene Milford; art director: Richard Day; music score: Leonard Bernstein. Cast : Marlon Brando ( Terry Malloy ); Eva Marie Saint ( Edie Doyle ); Karl Malden ( Father Barry ); Lee J. Cobb ( Johnny Friendly ); Rod Steiger ( Charles Malloy ); John Hamilton (" Pop " Doyle ); Pat Henning (" Kayo " Dugan ); James Westerfield ( Big Mac ); Leif Erickson ( Glover ); Martin Balsam ( Gilette ); Tony Galento ( Truck ); Tami Maurriello ( Tillio ); Abe Simon ( Barney ); John Heldabrand ( Mott ); Rudy Bond ( Moose ); Thomas Handley ( Tommy ); Anne Hegira ( Mrs. Collins ); Don Blackman ( Luke ); Arthur Keegan ( Jimmy ); Barry Macollum (J.P.); Mike O'Dowd ( Specs ); Fred Gwynn ( Slim ); Pat Hingle ( Bartender ). Awards: Oscars for Best Picture, Best Director, Best Actor (Brando), Best Supporting Actress (Saint), Best Writing-Story and Screenplay, Best Cinematography-Black and White, Best Art Direction-Black and White, and Best Editing, 1954; New York Film Critics Awards for Best Picture, Best Direction, and Best Actor (Brando); Venice Film Festival, Silver Prize, 1954. Schulberg, Budd, On the Waterfront , New York, 1955; Carbondale, Illinois, 1980. Tailleur, Roger, Elia Kazan , Paris, 1966; revised edition, 1971. Ciment, Michel, Kazan on Kazan , New York, 1974. Parish, James R., and Michael Pitts, The Great Gangster Pictures , Metuchen, New Jersey, 1976. Davies, Philip, and Brian Neve, Cinema , Politics , and Society in America , Manchester, 1981. Pauly, Thomas H., An American Odyssey: Elia Kazan and American Culture , Philadelphia, 1983. Downing, David, Marlon Brando , London, 1984. Carey, Gary, Marlon Brando: The Only Contender , London, 1985. Michaels, Lloyd, Elia Kazan: A Guide to References and Resources , Boston, 1985. Higham, Charles, Brando: The Unauthorized Biography , London, 1987. Kazan, Elia, Elia Kazan: A Life , New York, 1988, 1989, 1997. Grobel, Lawrence, Conversations with Brando , Lanham, 1993, 1999. Brando, Marlon, Songs My Mother Taught Me , with Robert Lindsey, New York, 1994. Malden, Karl, and Carla Malden, When Do I Start? : A Memoir , New York, 1997. Girgus, Sam B., Hollywood Renaissance: The Cinema of Democracy in the Era of Ford, Capra and Kazan , New York, 1998. Lobrutto, Elia Kazan , Old Tappan, 1999. Young, Jeff, editor, Kazan—The Master Director Discusses His Films: Interviews with Elia Kazan , New York, 1999. Baer, William, editor, Elia Kazan: Interviews , Jackson, 2000. Johnson, Malcolm, "Crime on the Waterfront," in New York Sun , 8 November-10 December 1948. Brinson, Peter, "Brooder," in Films and Filming (London), October 1954. Anderson, Lindsay, "The Last Sequence of On the Waterfront ," in Sight and Sound (London), January-March 1955. Hendricks, Gordon, in Film Culture (New York), January 1955. Hughes, Robert, "On the Waterfront: A Defense," in Sight and Sound (London), Spring 1955. Laurot, Edouard De, in Film Culture (New York), Summer 1955. McVay, Douglas, "The Brando Mutiny," in Films and Filming (London), December 1962. Tailleur, Roger, "Elia Kazan and the House Un-American Activities Committee," in Film Comment (New York), Fall 1966. Hall, John Dennis, "Method Master: Rod Steiger's Career," in Films and Filming (London), December 1970 and January 1971. Smith, J. M. "Three Liberal Films," in Movie (London), Winter 1971–72. Haskell, Molly, articles on Brando, in Village Voice (New York), 14 June-30 August 1973. Biskind, Peter, "The Politics of Power in On the Waterfront ," in Film Quarterly (Berkeley), Fall 1975. Borde, R., in Filmihullu (Helsinki), no. 5, 1976. Theberge, Rita, in Cinema Texas Program Notes (Austin), 1 December 1976. Hey, Kenneth, in Film and History (Newark, New Jersey), December 1979. "Kazan Section" of Positif (Paris), April 1981. Canby, V., "My Hero May be Your Stoolie," in New York Times , vol. 138, section 2, 27 August 1989. Caprara, V., "I tre 'scandali' di un capolavoro," in Filmcritica (Rome), January-February 1990. Alion, Yves, "Les quatre films du docteur Brando," in Revue du Cinéma (Paris), no. 479, February 1992. Manso, P., "Bringing Up Baby," in Premiere (New York), vol. 8, October 1994. Catsos, Gregory J.M., "Immediate Reward," in Outré (Evanston), vol. 1, no. 4, 1995. Reeves, Saskia, "Caged Birds," in Sight & Sound (London), vol. 6, no. 2, February 1996. Braudy, L., "'No Body's Perfect': Method Acting and 50s Culture," in Michigan Quarterly Review , vol. 35, no. 1, 1996. Schulberg, B., "Life in Hollywood Department," in New Yorker , vol. 74, 30 March 1998. Wheatcroft, Geoffrey, "The Waterfront All Over Again: He Told the Truth. They Lied for Communism. And He's the Bad Guy?" in Wall Street Journal (New York), 19 March 1999. Bosworth, Patricia, "Kazan's Choice," in Vanity Fair (New York), vol. 469, September 1999. The genesis of On the Waterfront is nearly as fascinating as the film itself. In April 1948, a New York dock hiring boss was murdered; it was the second killing in a short time. Reporter Malcolm Johnson was assigned by the now-defunct New York Sun to cover the story. Johnson's initial inquiries developed into a full investigation of waterfront crime. His findings were revealed in a series of 24 pieces, called "Crime on the Waterfront," published in the Sun between 8 November–10 December 1948. The exposé revealed rampant thievery, bribery, shake-downs, kickbacks, payoffs, shylocking and murder that was costing the port of New York millions of dollars in lost shipping trade. The articles earned Johnson a Pulitzer Prize. Elia Kazan was among the most successful and influential directors on Broadway and in Hollywood at this time. Despite his considerable reputation, Kazan had fallen into disfavor with many for his cooperation with the House Un-American Activities Committee during their investigations of communist activity in the film industry. Budd Schulberg was an established author who had won esteem for his novel about motion picture business What Makes Sammy Run ?, and his hard-hitting exposé of prize-fighting, The Harder They Fall , as well as the best-seller The Disenchanted . Like Kazan, Schulberg had also flirted with communism in the 1930s and voluntarily testified before HUAC in 1951. Schulberg had already drafted a script based on Johnson's articles when Kazan approached him about doing a film on the east coast. Their collaboration resulted in a script based on the waterfront scandals but imbued with a message about the virtues of "rightthinking men in a vital democracy." Although the project was supported by the combined expertise of Kazan/Schulberg, no Hollywood studio would finance the venture; some argued that the issues were too depressing, others that filming on actual locations would be too dangerous, but ultimately the reason for rejection seemed to be the meager commercial prospects. Just as the project seemed unrealizable, independent producer Sam Spiegel, looking for a property, accepted the challenge and financed the film. In keeping with the documentary nature of its source material, On the Waterfront was to be filmed on the streets and docks of Hoboken, New Jersey, where it takes place. With a singularity of purpose, the film was to expose not only the corruption of the waterfront unions but also reflect the day-to-day struggle for work and dignity among the longshoremen. Frank Sinatra was approached for the leading role of a slow-witted dockworker who, through a strange brew of conscience and vengeance, emerges from the group to break the stranglehold maintained by the corrupt union. When terms with Sinatra could not be reached, Marlon Brando, who had won Oscar nominations in two previous Kazan films, was signed. A substantial array of acting talent was recruited for supporting roles, including Lee J. Cobb, Rod Steiger, Karl Malden and Eva Marie Saint. The production cost $820,000 and made an immediate and astonishing impression on both audiences and critics when released in 1954. The narrative centers around Terry Malloy, a former boxer turned dockworker, who becomes the unwitting pawn in the murder of a fellow longshoreman preparing to testify against gangsters who tyrannize the docks. Through the insistent priest, Father Barry, Terry is drawn into a moral dilemma. His loyalties to the racketeers, led by Johnny Friendly and Terry's brother Charlie, have been weakened by the murder. His growing affection for Edie and the persuasive tactics of Father Barry gradually draw his allegiance away from the gangsters. Terry is served with a subpoena to testify before the Waterfront Crime Commission about the Joey Doyle murder. In love with Edie, manipulated by the priest and in disfavor with the mob, Terry's conversion is completed when his own brother is brutally murdered as a warning to him. Terry testifies against Friendly and is ostracized as a "stoolie." When he confronts Friendly and his cohorts, he is brutally beaten. In a final effort of will, Terry rallies and leads the loitering longshoremen to work as an act of defiance against the racketeers. The technique of the film is as basic and effective as the story. There are no attempts at a self-conscious aesthetics or pyrotechnics. There are no compromises in rendering the locale as anything but the urban jungle that it is. We follow the story as it takes us into the cargo holds of the ships, the slum dwelling of the workers, the shack that serves as headquarters for the union leaders, the seedy bars, the littered streets, the rooftops, the alleyways. Everything about the film is grimy and oppressive. The waterfront is presented as a harsh place where violence and betrayal have become an accepted way of life; it is a place where the strong prey upon the weak and a self-defeating code of silence prevails. We not only see and hear the sub-human malaise of the neighborhood, but we feel the suffering of the dockworkers as they mull about in a fraternal hopelessness. At the center of On the Waterfront is Terry Malloy. Terry is a man in his 30s always exploited by others; Johnny Friendly callously uses him to set up Joey Doyle just as Father Barry manipulates him against his loyalties. Terry initiates nothing of his own, yet he is redeemed through love from the limitations of his background. Left to himself, it is probable that he would remain just another likable but expendable dockworker and errand boy. At the beginning of the film, Terry is barely articulate and painfully confused about himself and his situation. Not only is he mired in the urban jungle of greed, deceit and betrayal, but he is at loss to understand it or change himself. As he tells Edie in the tavern; "Wanna know my philosophy of life?" Yet beneath his layered exterior of toughness, Terry possesses traits that seem contradictory to his own philosophy: his fondness for pigeons, the tender way he wears Edie's glove, the rejection he feels at being excluded from the protection and confidence of his brother. As Brando interprets him, Terry Malloy also possesses a touch of sadness. He is a man who, at one time, had the opportunity to rise above his condition through his skill as a prizefighter. Although he could have had a personal sense of self-respect and self-worth as a contender for the title, he was prevented from it by others (including his brother). Embittered but not self-piteous, he reveals his self-awareness in a touching scene with his brother in the back seat of a cab. Although well suppressed, the seed of something better resides in him. It is Edie's love that nurtures that seed. Reduced to its basics, On the Waterfront is a morality tale about how corruption can (indeed must ) be fought and defeated when a man of courage and conscience emerges from the crowd to oppose the corruption. Although the narrative progresses in a linear manner without flashbacks and subplots, the power of the film is announced from the opening scene, with its assertive orchestral percussion, in which Terry is dispatched to lure Joey Doyle into a setup. In addition to dominating the Academy Awards of 1954, it garnered some additional laurels. It brought credibility to the method technique of acting taught at the Actors Studio. It certified the acting credentials of a number of talents trained for the theater. It brought acclaim and stardom to Marlon Brando, and even briefly made mumbling fashionable. It also created at least one enduring vignette ("I coulda been a contender") which has frequently been parodied. 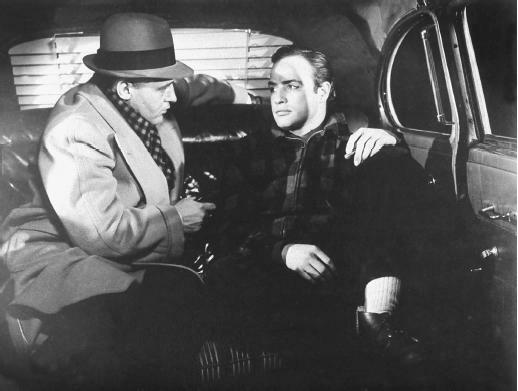 Even though On the Waterfront is universally hailed as a milestone, the film's denouement still taints its reputation as a classic. Terry informs before a congressional committee on those who have exploited him and the other longshoremen. In the context of the narrative, he is elevated to heroic proportions (even though his heroism is misunderstood by others) through a behavior that is typically classified by both the film and society as reprehensible. As a result of his informing through public testimony, Terry is considered an outcast by everyone from the police assigned to protect him to his friends who now refuse to speak to him. But after he confronts Friendly, he is the lone man of strength who wins the support of the longshoremen. In a turn-about, the act of informing is not only justified but sanitized and made admirable. The fact that Terry moves, perhaps too conveniently, from a complex individual through the act of informing to an emblem of Christian integrity and suffering has aggravated certain viewers. Some have argued that the optimistic ending is a reversal of the film's narrative premise. In another attack, critic-filmmaker Lindsay Anderson, writing in Sight and Sound , considered the film's violent conclusion to be "implicitly (if unconsciously) fascist." Others have cited the parallels to Kazan-Schulberg's own situation and objected to the ending as an unconvincing effort to vindicate their own informing to HUAC. Whatever interpretation one prefers, it is interesting to observe that in writing the novelization of his screenplay, Schulberg chose to end it not with Terry's heroic leadership but with his ignoble death (stabbed 27 times with an ice pick and then deposited in a barrel of lime left in a Jersey swamp). None of these criticisms, however, has diminished the dramatic power of the film. Regardless of political considerations or implications, the film has found its way into the ranks of cinema classics.